Toss slaw with dressing. Allow to sit for 1 hour, then strain. Keep liquid for making another batch. Whisk together tempura mix and ice cold sparking water just until it is combined. While your batter rests, pour oil into heavy bottom, tall sided pot and bring up to 350°F. Gently dredge filets through the tempura until evenly coated, then dip into oil slowly 3 at a time; do not overcrowd the pot. Cook for 3 to 4 minutes or until they begin to float, remove from oil and drain on paper towels and season with salt and pepper. Warm tortillas over oven flame until they begin to brown and blister. 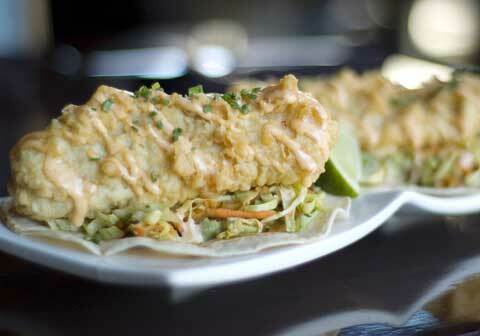 Place small amount of slaw on warmed tortilla then place fish on top of slaw. Place liberal amount of sriracha aioli on top and garnish with cilantro.